EA, an American video game company noted for games like FIFA and Madden NFL, stated that they had added up to three times as much content in comparison to the original Star Wars Battlefront. CEO, Andrew Wison has stated that they took prior criticism seriously and will improve on the lack of content that the original offered. This is a note to take as Battlefront itself did not include a campaign mode which left many players confused. The reason for this being that previous Battlefront games focused more on multiplayer rather than a single campaign mode. EA also hopes to ship out much more copies of the game in comparison to the first, and the added content should help that. The game will go further than it has in the past as it will go across the time period of all Star Wars films as well, and as EA Chief Financial Officer Blake Jorgensen said himself, the game will be able to go through parts seen in the new movies instead of just the historical ones used before. Space Battles will be returning which was not included in the original. Class-based multiplayer will be included in the game and will bring much needed to depth to the multiplayer mode. News that fans will take with open arms is that there will be a single-player campaign mode. This single-player campaign will loads of content not seen in the original. That should be enough to justify why fans should check this one out. 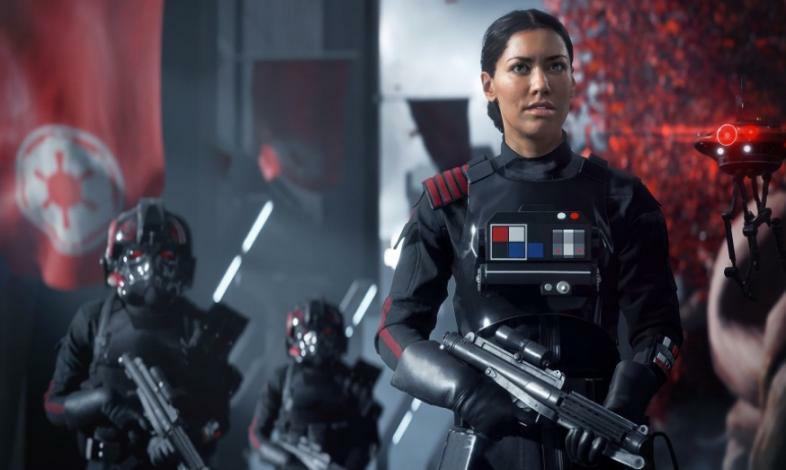 The story will follow Iden Versio who is the leader Galactic Empire, which is an elite special force unit. This is interesting as while the main character isn’t technically evil, it’s still a darker take on the story. Iden’s goal being to avenge the death of the emperor, you’ll still be playing as someone who is a heroic leader. You’ll also be given chances to control other characters such as Luke Skywalker as shown in a trailer. Players will be following the Inferno Squad, also known as Inferno Squadron, who are a special operations unit of the Imperial Navy. They are well versed in flight combat as they can be Starfighter pilots when required. The Inferno Squad is the defense against the ruthless Rebel Alliance. That’s where the player comes in as they battle against this Alliance. There will still be fans who believe that the Empire is truly evil. This is further proved by Douglas Reily who is senior director of Franchise Management. He stated in an interview that Iden is a hero, and that the Empire isn’t necessarily the bad guys, but on “the other side of the conflict.” So for fans who believe that the Empire is evil, there is your answer. Battlefront 2 is set to be one of the biggest games for EA this year. Battlefront 2 is being released a few weeks before the release of the new Star Wars movie. That movie being Star Wars Episode 8 The Last Jedi which will be released on December 15, while Battlefront 2 has a release date for November 17. So it will be interesting to see how they incorporate it in and if so, then how would they go about it. The original Battlefront had more original content in the game. Battlefront 2 on the other hand will be going through just about all the Star Wars games. There will be recognizable characters and planets, and fans will be thrilled to know that they are returning.